groundwork for the fundamental scientific basis of CLRT. Yes it is lengthy, but equal parts delicious and nutritious. wave theory of information and biological laser theory. Dig it. View more presentations from solarsonic. 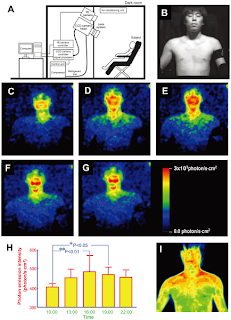 In all images, photon emission intensity from the face was higher than from the body. Moreover, photon emission intensity from the face was not homogeneous: the central area around the mouth and the cheeks was higher than the lateral area and the orbits. Furthermore, the photon emission intensity on the face and upper body appeared to display time-dependent changes. Ultraweak biophoton emission was completely different from thermographic images showing surface temperature (Fig.1I). High photon emission were detected from the cheeks, followed by the upper neck and the forehead, while high temperature was detected in the supraclavicular lateral neck region, from which photon emission was low. No significant correlation of daily photon intensity and temperature was found, and the dissimilarity between photon emission and thermal image suggest that the diurnal rhythm of photon emission is not a consequence of a change of temperature or microcirculation.